This map, as stated in the title, has all items and NPCs. If requested I can merge it with the 1.1.2 all items map because I only added 1.2 items (1010) and not the 1.1 items (603) My youtube is gamingmaster879 so PM me there not on curse. Good to know about changes, earlier version for for 1.2.3 now a workshop and by using user can merge items and NPCs with the 1.1.2. all items map. It was nice to get detail about first update of Terraria which gives unique game playing experience to players. How do I install the maps to Terraria? I'm using Mobile. You have to click the orange download button witch is located at the top right corner. Could you add the PDA or at least the crafting items for it. um whats the port? amd ip? Your starting equipment will include a Copper Pickaxe, a Copper Axe and a Copper Shortsword.The latter is barely decent for killing weak enemies such as Slimes, so it is advisable to craft a higher tierBroadsword as soon as possible, as their wide swing arc makes them more reliable for melee combat. Items that can be combined for crafting will show "Material" when moused over.If you're unsure about what to do with an item, show it to the Guide. A House is made by having a room that has blocks around it. At least 7x6. Must have background walls. A Torch, Table, and a Chair, to start off with. 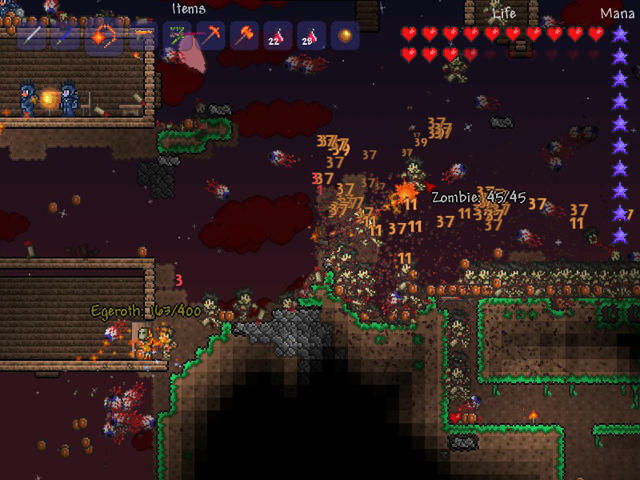 Be sure to build a properly-defended base:placing background walls will prevent monsters from spawning inside, and having NPCs join you will also reduce the spawn rate of enemies nearby.Most NPCs will join you when you do certain feats (such as finding explosives or having a certain wealth), while you might stumble upon some others while exploring underground. If you can't handle night-time monsters, dig down from your shelter to make a mineshaft and dig for oresand treasures.Remember however to bring Torches to light the way and platforms to get back to the surface, and beware the monsters that inhabit the lower layers. And don't forget that if you release water, it will extinguish your torches, so place more than one.